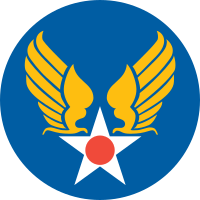 The United States Army Air Forces (USAAF) was the military aviation arm of the United States of America during and immediately after World War II. It was the direct precursor to the United States Air Force, established in 1947. At its peak strength in 1944, the USAAF had over 2.4 million men and women in service, nearly 80,000 aircraft and 783 permanent bases, and operated from more than 2,000 airfields worldwide.